As the Special Representative of the President and Secretary of State on Holocaust-Era Issues during the Clinton administration, Ambassador Eizenstat successfully negotiated major agreements with Switzerland, Germany, Austria, France, and other European countries covering restitution of property, payment for slave and forced laborers, recovery of looted art, bank accounts, and payment of insurance policies. His book on these events, Imperfect Justice: Looted Assets, Slave Labor, and the Unfinished Business of World War II, has been translated into German, French, Czech and Hebrew. 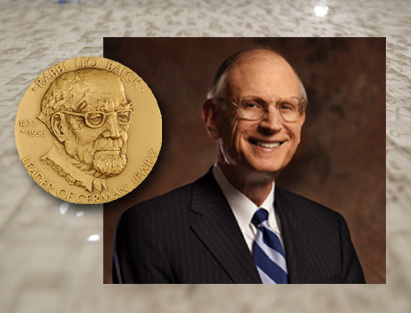 The Honorable W. Michael Blumenthal, former US Secretary of the Treasury and current Director of the Jewish Museum Berlin, will present the Leo Baeck Medal to Ambassador Eizenstat in recognition of his advocacy for Holocaust victims and their heirs. On the same evening, Ambassador Eizenstat will deliver the 56th Leo Baeck Memorial Lecture. His talk, titled, The Future of the Jews: How global forces are impacting the Jewish people, Israel, and its relationship with the United States, will explore how the obligation to honor the victims of the Holocaust informs approaches to the current challenges and opportunities faced by the global Jewish community today. Admission to the lecture is free, but we kindly request that you register in advance at (212) 744-6400 or mlegaspi@lbi.cjh.org. A separate ticket is required for the dinner. To reserve tickets for the dinner, see the prices below and call (212) 744-6400.